Ashar Lockeys is provides the most advanced automatic key cutting machines. We offer the Xhorse Condor XC-Mini Key cutting machines. 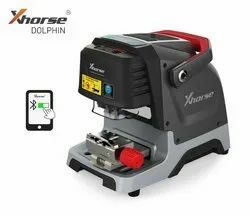 DOLPHIN is the latest automatic key cutting machine from Xhorse. Standard equipped two clamps M1 and M2, supports Sided, Track, Dimple and Tibbe keys. Optional M3 clamp and M4 clamp are available, M3 clamp is applicable to Ford FO21 & Citroen SX9 keys, M4 clamp is applicable to single sided house-key. Free online update software, the latest update information will be released timely, 24hours support server online update, no need to back for update. For more inforamtion, please contact us. Support more than 60 Global Brand,2000 car models and 20000 All key lost database!